Note: Post updated January 2018. Bio: Based in New Orleans, and a renowned pastel painter for 30+years, Sandra Burshell received her artistic formation at the Art Institute of Chicago, the New Orleans Academy of Fine Arts, a BA Art from Temple University, and a Masters from Tyler School of Art, Temple University. 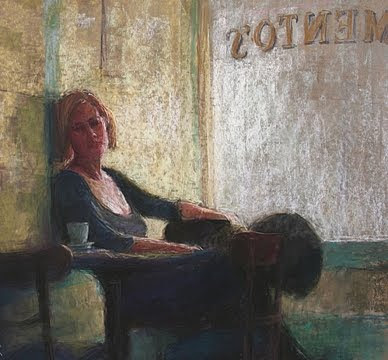 She has exhibited widely, won many awards, and was featured in an article by Bill Creevy in the June 2010 issue of the Pastel Journal, which may be read on her website under the "Articles" link.Media: Pastel, oil. Navigation: Main menu remains on screen throughout. Gallery: A series of 3 pages of images. Image View: No data on dimensions in most cases, although the mouseover will reveal the title, medium and availability of the work. If you go to the Carol Robinson gallery website you will find some more of Burshell’s paintings (although her name is mis-spelled Bushell, without the "r", on the gallery's website). Soft Glow, Casmento's (featured here) is 21x24 ins.